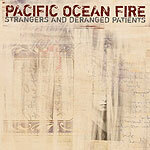 CD review: "Strangers and Deranged Patients"
With a variety of approaches that range in sound from the arena excess of early U2 to the even earlier country-rock grit of Gram Parsons to a mellow kind of Jayhawks folk-rock groove, England's Pacific Ocean Fire suffers not a all from talent or musicality, but perhaps a touch from a lack of cohesiveness on their new CD from the locally based Azra Records. Based out of Leicester, the band displays a thick, full sound throughout the recording. And their delivery is consistently confident, their playing always sharp. But the hopping from style to style can make for a disjointed listening experience  particularly as there doesn't seem to be any larger, overarching denominator to tie it all together. Each song by itself is an interesting listen; hearing them all one after another is just plain confusing.